Our convenient location is here to serve the needs mechanics, dealerships, residents and insurance agents. Using recycled parts is smart. Not only for the savings realized over the cost of new parts, but the perfect choice for the environment too. 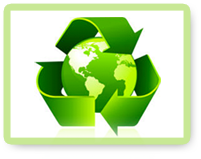 The automotive recycling industry is no longer in the "Junk" business. But instead uses state-of-the-art equipment to reclaim, clean and recondition auto salvage in automotive recycling centers nationwide. At Green Light Used Auto Parts, we know that buying a vehicle is an expensive investment and maintaining your car, truck or SUV can be just as pricey. For your convenience, we make hundreds of car parts available for purchase. You can depend on us for all of your replacement needs at affordable prices. Our Sales and Customer Service staff combines extensive experience and training with the latest technology – to find the part you need as quickly as possible. At Green Light Used Auto Parts we strive to meet the nees of our customers for reliable, quality auto parts for domestic & foreign-made cars. Over the years, we have grown our operation to address the needs of automotive service providers, while continuing to provide quality parts for the consumers who have come to rely on our commitment and service.